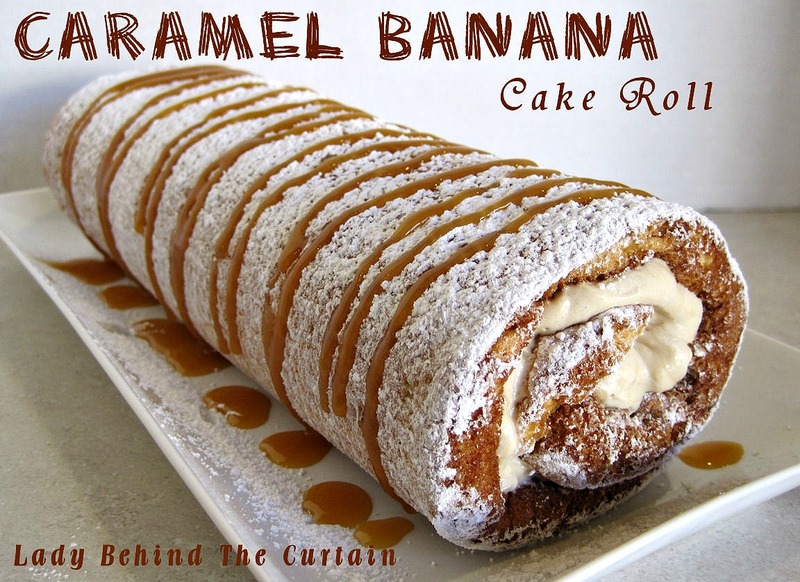 Caramel Banana Cake Roll PLUS How to Video! I love making cake rolls. They look so impressive and are so easy to put together. 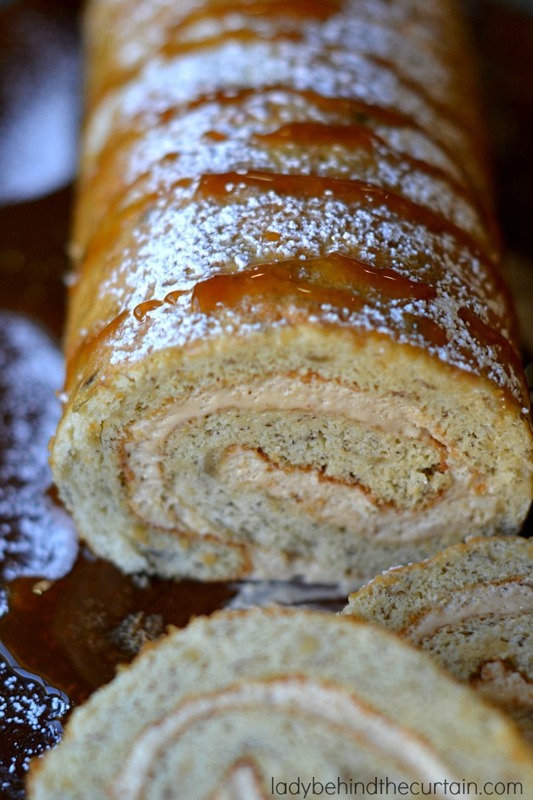 This Caramel Banana Cake Roll is a light version to the typical cake roll. With a light and fluffy sponge cake full of banana flavor and filled with a caramel filling. Do you think making a cake is too hard? Don’t worry I’ve got you covered! 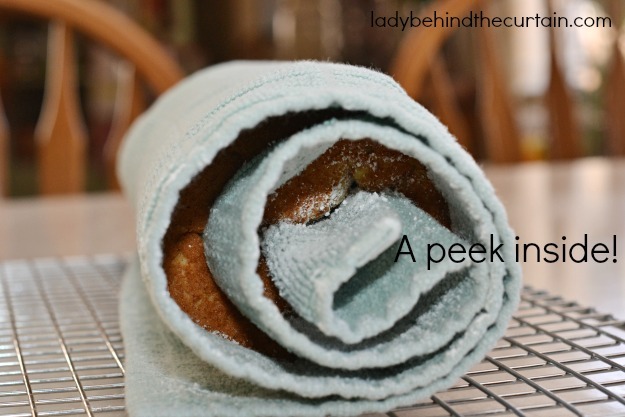 Scroll down and watch my “HOW TO MAKE A CAKE ROLL” video to see how easy it really is! Always have a dessert ready! Make this Caramel Banana Cake Roll ahead and store in the freezer for last minute entertaining! 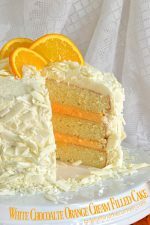 What makes this cake so light? The whipped egg whites! 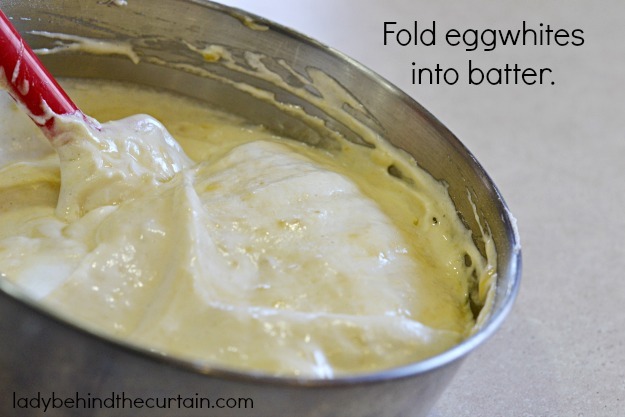 Fold egg whites into batter. 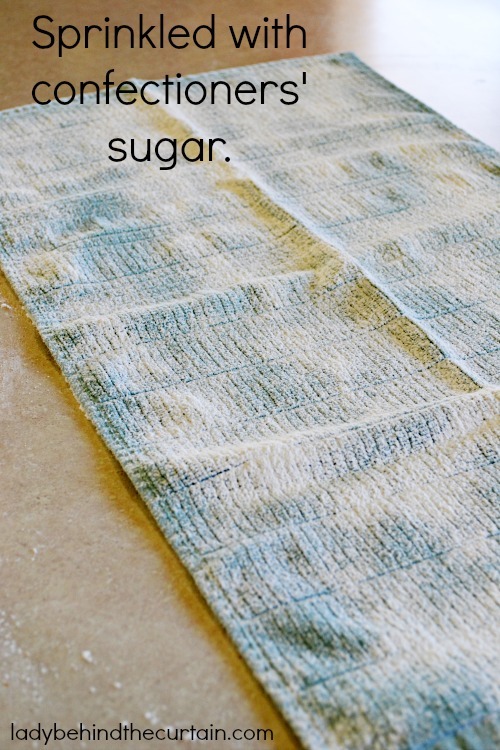 Cover a clean kitchen towel with sprinkled on confectioners’ sugar. 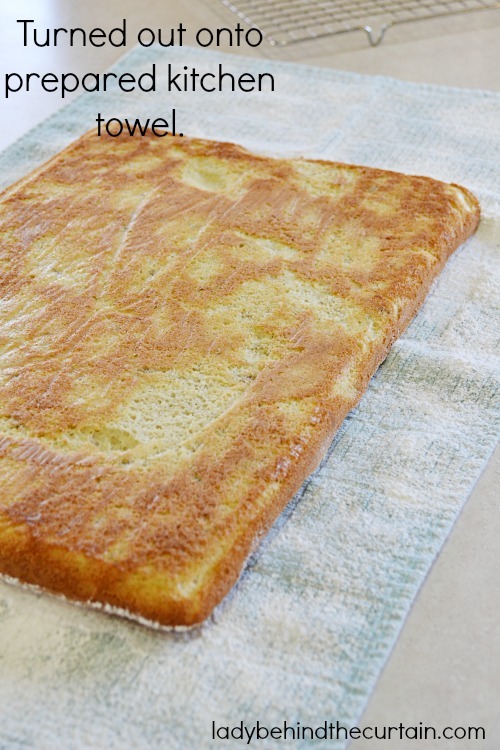 Turn baked and cooled cake onto prepared towel. 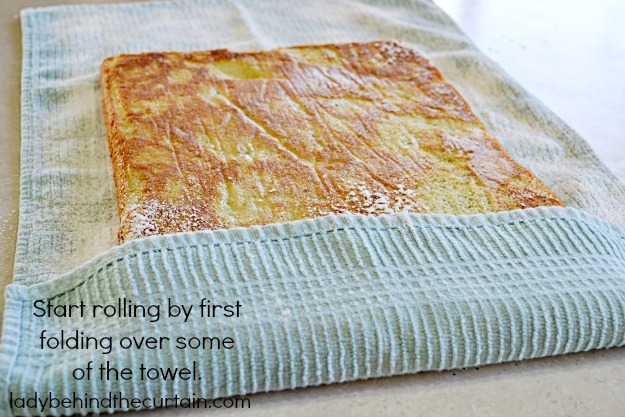 Roll in a jelly roll style. Let sit until completely cooled. Evenly spread on the caramel filling. Roll back up. At this point you can choose to slice and serve. I like to freeze my cake roll first. This way I will get beautiful slices. 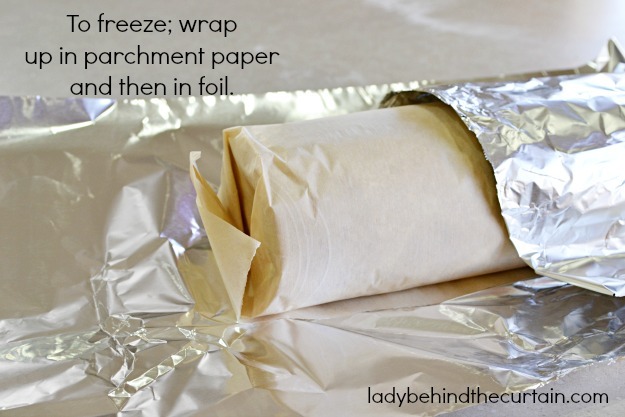 TO FREEZE: Wrap cake roll in parchment paper and then in foil. FOR A DETAILED LOOK…. WATCH MY VIDEO “HOW TO MAKE A CAKE ROLL”! Spray a 15-in. x 10-in. x 1-in. baking pan with non stick cooking spray; line with parchment paper and spray the top of the parchment paper with non stick cooking spray; set aside. Combine the flour, baking soda, salt and baking powder. In a large mixing bowl, beat eggs for 5 minutes; add 1/2 cup sugar, banana and vanilla. 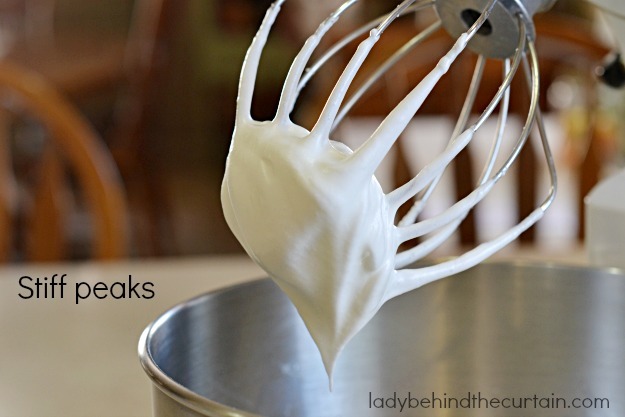 In a small mixing bowl, beat egg whites on medium speed until soft peaks form. To the egg whites gradually beat in remaining sugar, a tablespoon at a time, on high until sti﻿ff peaks form. Add flour mixture to banana mixture; mix gently until combined. Fold in egg white mixture. Bake for 10-12 minutes or until cake ﻿springs back when lightly touched. Cool 5 minutes; run a knife around the edges to loosen. 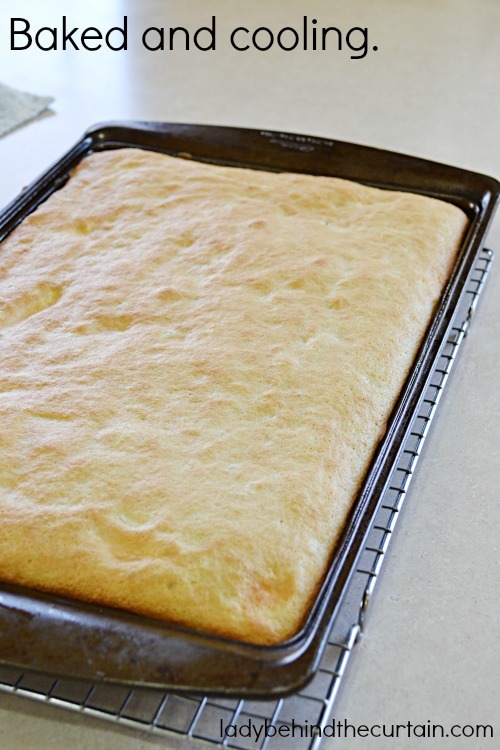 Turn cake onto a kitchen towel dusted with confectioners sugar. Gently peel off parchment paper. 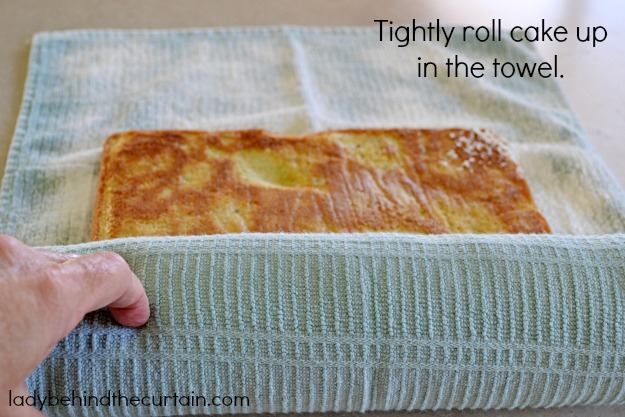 Roll up cake in towel jelly-roll style, starting with a short side. Once the roll is cooled, unroll the cake. Because the cake has cooled in a rolled position it will easily re-roll. In a mixing bowl, beat cream cheese and brown sugar until smooth and sugar is dissolved. Beat in vanilla; fold in the whipped topping. 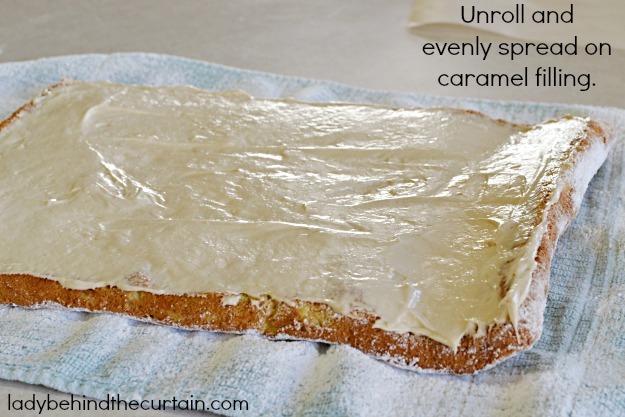 Unroll cake and evenly spread the filling. Sprinkle with confectioners' sugar and drizzle caramel ice cream topping. This looks absolutely amazing! I love the banana caramel combo. I have never made a cake roll before. I definitely need to make one now!! Why have I never made a cake roll? This looks insane. I love all the flavors. Holy cow! This looks divine! I love pumpkin roll but I rarely make it because it make me mad when it cracks or splits. Yours looks absolutely perfect though. Yum! 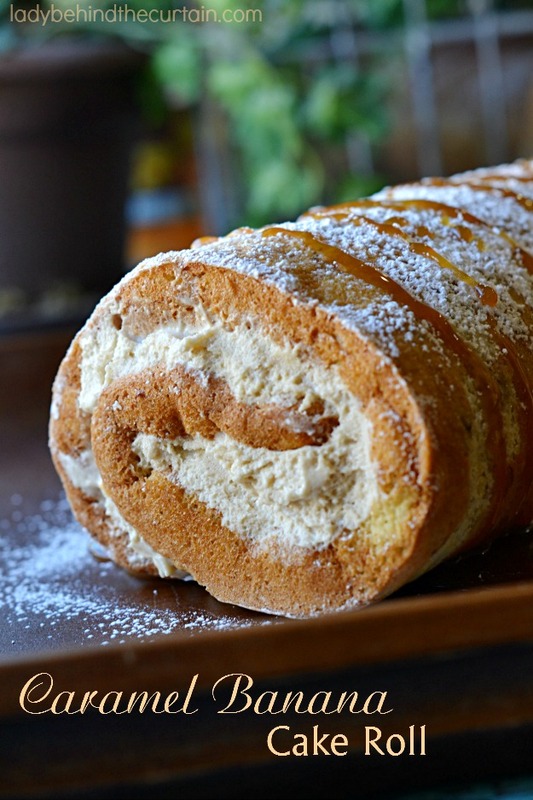 I love cake rolls – this one looks so good. I love that it is a lighter version. I’d love it if you would link this to Crazy Sweet Tuesday! This looks a million times better than the cake roll that I just made. How do you make it so round? Looks awesome and easy to make,will make soon. This does look impressive! I love the flavour combo–delicious! Wow, that looks perfect! I wish I was eating a slice of that for breakfast right now. 😉 I love anything involving bananas! 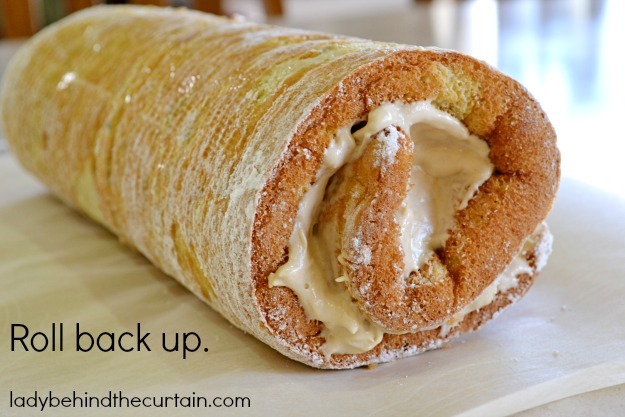 Well, you’ve actually inspired me to attempt a cake roll….well done! 🙂 This looks amazing and the flavor combo is luscious! You are so right! These cakes do look super impressive!! I am loving the flavor combo that you came up with on it…makes me want a piece right now!!! This looks so delish! I have never made a cake roll, so I think it’s about time!! What a beautiful, and delicious looking, cake. I’ve been wanting to make a roll, but I’m afraid I’ll brake the cake while rolling it. You make it seem doable, though! Really beautiful!!! I think this is the ‘wow’ dessert I’ll bring at Thanksgiving! It’s mouth watering! Looks yummy. I had stopped here and drooled over that great cake roll. Then FORGOT to save your page, pin the picture.. or ANYTHING. I looked and looked for it again. Finally gave up. Then….stopped by 36th Avenue and saw it again!! Yeah! Me and the kitchen have a date today! This is a beautiful roll. I just love this combination of Caramel and Banana, it looks delicious! Hope you are having a great week and thanks so much for sharing with Full Plate Thursday. This looks amazing! I’m so excited to try it! This looks so good! It makes my mouth water. Hi, I found your blog from the linky party at Everyday Mom’s Meals. This looks absolutely beautiful. I want, I want, I want! This cake roll looks amazing. I love the flavors and can’t wait to try it out! 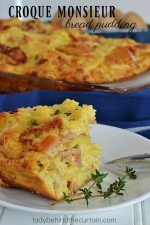 Your recipe is featured on Full Plate Thursday. Hope you are having a great day and enjoy your Red Plate! MMMMM. This looks amazing!! 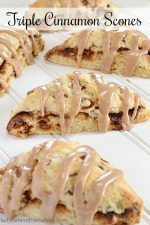 I am on a caramel kick right now – this would be so fun to try! Great looking recipe. I can’t wait to try. I’ve even thought about subbing chopped apple bits in place of the banana for more of a fall recipe. Crazy how easy this recipe sounds. I never made a cake roll before but now I definitely have to! On the cool whip, my question is this. you say one cup, is that the entire 8oz (Because 8oz. is one cup) carton of cool whip or just one cup out of a carton of cool whip? Hi Sheryl, Could you tell me if any of these rolls could be frozen and for how long of a period? Thank you for these wonderful recipe’s. What is whipped topping ? 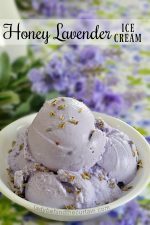 I want to make this tonight to take to an event tomorrow afternoon – does it still taste as good a day old? Thanks! 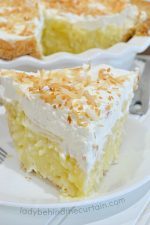 Just found this recipe this week on Facebook and made it today.. Oh gosh so easy to make and looks just like your picture when I was done.. My family LOVES it and they want me to make it again,,, thank you for sharing this recipe! What’s the lemon for can it be left out or subbed I don’t usually have it on hand and can cake flour be subbed for all purpose or self rising or is it necessary???? Can this be made a head if time and freeze it? I would love to try this but I wonder if it would work with mashed raspberries in place of banana. I made this cake last week for guests, and wow! It was so delicious and everyone loved it so much, that not one piece was left over! I’m making it again next week for a morning coffee get together with my friends. Does this need to be refrigerated once it is made? Yes, store in the refrigerator. U have a step that says to peel off the wax paper. When would I even use it to start? I am new to the baking world. I made this on Saturday. It was very yummy! However, mine stuck to the wax paper and was almost a disaster. I dont know what happened, but I have great no-stick pans and with some spray probably would have been fine on its own without peeling off wax paper. Also have you ever tried a tiny bit of banana extract? Im going to add a tsp next time to bring out the banana flavor and add some pecans. Thank you for the recipe, it was still really good! 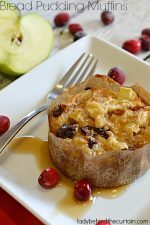 I have made this recipe a couple of times since December 2013 and it was a hit every time. 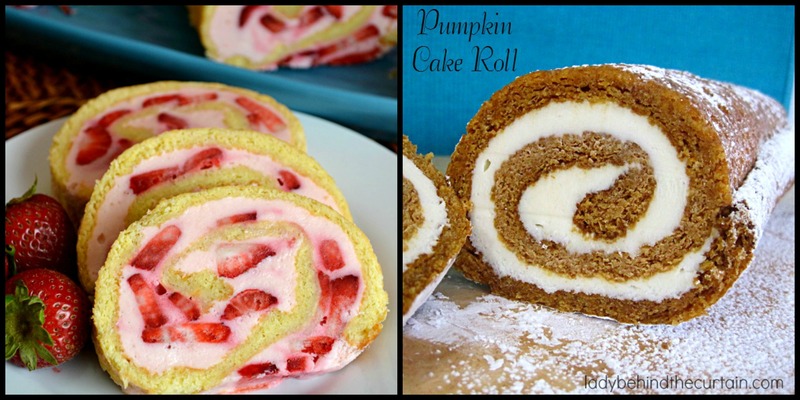 I make a variety of cake rolls and my Pumpkin roll was a big seller in my area at the Farmers Market this past fall. I am not a baker, but this roll looked so delicious I had to try it. And it was DELICIOUS, I added 1 banana in the filling and it is very nice!! This was amazing! I have made a lemon meringue roll and a strawberry roll and a banana split roll but this “takes the cake”! Ha! I added chopped pecans to the cake mixture and it was to die for. Never would have thought of a banana roll. Thank you so much for sharing this recipe. 5: In a small mixing bowl, beat egg whites on medium speed until soft peaks form. 6: Gradually beat in remaining sugar, a tablespoon at a time, on high until sti﻿ff peaks form. Question: When you say to add in the remaining sugar 1 tbsp at a time…..am I adding it to the egg whites or the banana mix? Tried it tonight. WOW. Thank you very much! Came out perfect! Can you use cake mix instead? Hi Shawna, sorry not for this cake. You need a sponge cake that is pliable enough to roll. 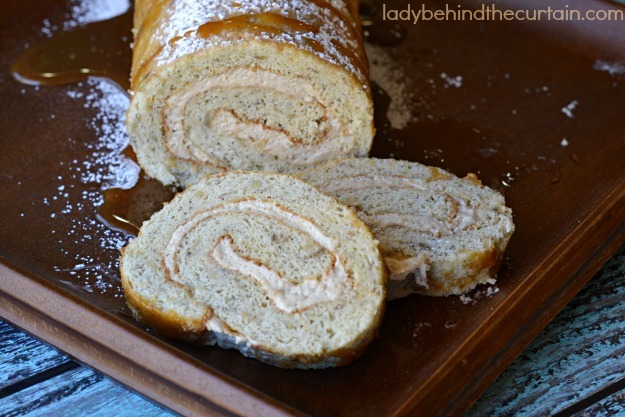 I am impressed with the caramel roll cake and would love to try it out! I am using my cell phone to do this. And I cannot copy the recipes. Will you please send via email? Thanks so much for your time and consideration. I have made the pumpkin roll at Thanksgiving and my family loved it. I will definitely have to try this variation. Thanks for sharing! Hi Cassandra, Beat eggs 5 minute then add the sugar, banana and vanilla; mix until combined. I have made this twice now and everyone loves it!